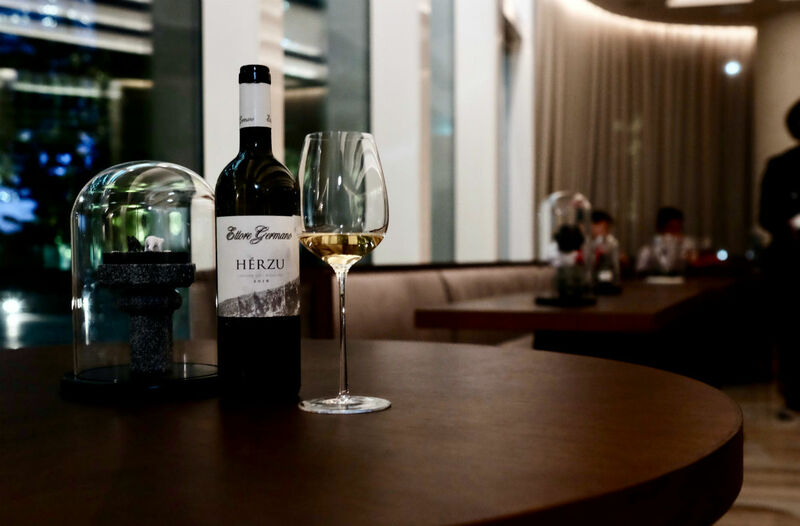 Preludio is set to wow Singapore’s dining scene with its whimsical version of “author’s cuisine”, and a wine pairing experience to match. If you aren’t familiar with “author’s cuisine”, it’s a culinary movement started over a decade ago in Spain by El Bulli’s Ferran Adria. The idea there is that a chef would work his magic with absolutely no rules, bound neither by heritage nor cuisine type. He’d work with different ingredients to create atypical flavour, texture and aroma combinations; he’s likely too to marry modern technique with traditional cooking methods. Literally, nothing is “off” the table. It’s also an approach critics accuse of being self-indulgent and highfalutin. Progressive restaurant Preludio is hardly the first to introduce this unconventional culinary concept to Singapore – André Chiang’s “octo-philosophy” approach in his now-defunct Restaurant André is a notable pioneer, while Ivan Brehm’s Restaurant Nouri has established itself in local dining circles as a recent firm favourite – but it may just be the one to finally popularise it. With his fancy new digs in Frasers Tower, chef-owner Fernando Arevalo – formerly of Artemis Grill – is finally free to provide his own take on author’s cuisine. While Colombian native Arevalo intends for Preludio to refresh its theme every 12- or 18 months, for its first debut kicks off with “Monochrome”. Preludio – unbound by colour. If your definition of monochrome is black and white, you’re on the right track. Basically Chef Arevalo and his team strip the dishes in your omakase style meal down to the two basic colours to challenge your conceptions about food. He forces you to think. Would food without colour taste different? What ingredients did he use? Where does that flavour – or texture – come from? For his dish “Elude”, for example, there’s the use of white beetroot, yogurt, and burrata, offset by the black of Sturia caviar. There’s “Peek A Boo”, a sheet of paper-thin rice cracker under which hides a combination of hyacinth bulbs, smoked eel, and girolle mushrooms. Sometimes the more unusual ingredients are even brought out for you to marvel over, such as those hyacinth bulbs. 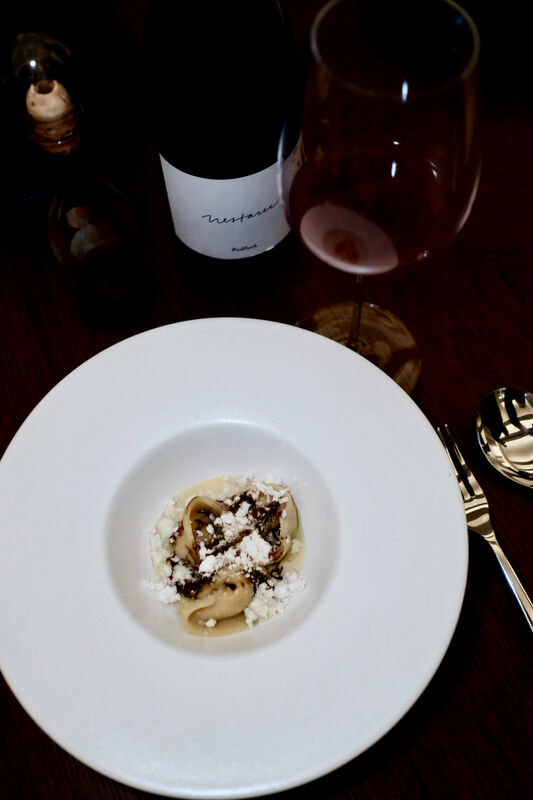 We love “La Cortina”, a squash and amaretto-filled agnolotti pasta dish dusted with parmesan and almond “snow”. The black here is offered as a 25-year old balsamic vinegar. Drizzled over the pasta its unctuous, almost chocolatey sweetness and light tangy acidity dancing the teasing tarantella on your tongue. Yet the most surprising – and eye-opening – dish was the “Pata Negra”. What looks wholly like medium-rare steak turns out to be Iberico pork presa, its squid ink crumb deceptive and coy. Char-black Piennolo tomatoes and a white carrot and potato puree complete the picture. It is delicious irony. But the best authors always have a great co-author or editor at their side. For Chef Arevalo at Preludio, that person is beverage manager Chip Steel. Steel offers up some of the most interesting and uncommon wine selections this side of town; in line with the theme, wines here are listed by white soil (limestone, chalk) and black soil (volcanic) types. For example there’s the Bone Jolly, a rose by Edmunds St John of California made with Gamay; the Langhe Herzu by Ettore Germano, a Riesling from Piemonte, Italy; Milan Nestarec’s Podfuck, a Czech wine vinified from Pinot Gris but looking wholly like a (light) red wine. Or how about Vi Di Glass, a light sweet Gewurtztraminer from Spain’s Gramona, who are better known as a cava producer? The wines – their provenance, vinification methods, even bottle shape – force you into quiet contemplation, as much as the food does. More importantly the wine pairings work very well in contrasting and complementing flavours in Arevalo’s dishes. We can’t recommend Preludio highly enough. The biggest challenge for Preludio – as with most author cuisine offerings – with its price point and concept. The fear here is it that gastrophiles may relegate it to mere destination dining; a tick for them to check off in some list. That is, until the next chapter of Preludio comes along, or when it gets its first award. And that would be a downright shame. Lunch at Preludio is $55++ for four courses, $98++ for seven (additional $55++ for wine pairings; three glasses). Dinner is $168++ (additional $132++ for wine pairing) for six courses and $218++ for eight courses (additional $158++ for wine pairing).